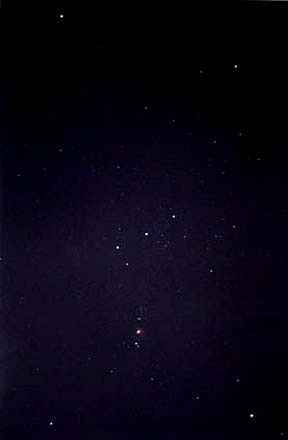 Time lapse photograph of the Orion constellation showing the three evenly spaced bright spots on a slant that make up what the Greek's thought was a belt from which "hung" the great hunter's sword. Egyptians considered this constellation and the nearby bright star, Sirius, to be the home of the gods that came to earth and created life and humankind. Each Egytian king wanted to return his soul to Orion and Sirius after death.The far left object of Orion's belt is the Horsehead Nebula, also known as Alnitak (Zeta Orionis). The middle belt object is the star, Alnilam, and the top of the belt is the star, Mintaka. November 10, 2001 Sedona, Arizona - French-born Robert Bauval, construction engineer and author, worked from 1974-1985 as a project manager and strategic engineer on construction projects in Saudi Arabia. He spoke this past weekend at the Earth Mysteries Conference in Sedona about the power of Egyptian talismans, physical objects that through magic and rituals were thought to bring the power of stars and gods into them; and his theory that the pyramids of Giza have the same alignment as the stars in the belt of Orion. He wrote a book about it with Adrian Gilbert in 1995 entitled, The Orion Mystery, Unlocking the Secrets of the Pyramids.